This beautiful genuine black/gray marble urn is from our Elegant Series and is a Double/Companion cremation urn . It has some distinctive markings of clouds, veins and swirls which are are a product of the natural formation of marble. These distinct markings make it a unique one of a kind piece. It has a large capacity fit for 2 adults or one adult and extra items like your loved ones favorite mementos or jewelry. It has a beautiful soft tone with a clean and elegant shape and is honed from real marble. The beveled top and bottom create a classic appearance. SHIPPING INFORMATION - When you place your order you will receive an email within a few hours with your tracking information - we ship the same day you order! UPS Ground shipping is fast and free but if you need overnight shipping we can do that also; just telephone us for details. Toll free 1-800-594-8022 More about our real marble urns: REAL NATURAL MARBLE HAS A DISTINCTIVE APPEARANCE UNMATCHED BY SYNTHETIC IMITATIONS. It is the traditional, costly material of statues and grave monuments and is instantly recognizable as such. This solid real marble is characaterized by the beautiful large and small natural veins in white, pink, grey and brown tones, and soft white cloudlike spots and swirls. 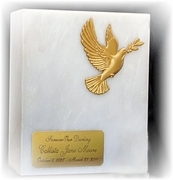 These special markings classify your urn as the best quality of real, natural stone. No two pieces are alike - each has its own special everlasting beauty..